The sweet tooth. Oh, the sweet tooth! I could have something sweet for every meal of the day and then a little more for dessert. Of course, I still wouldn’t turn down a bag of chips. Weight gain/belly size. Well, now that is. I think I got a head start on fast pace at the very beginning but somewhere in the early second trimester, things have evened out. Of course, since this pregnancy really started to show itself over the fall, the wardrobe is different and not for the better (see below). Lack of problems. I was blessed once again with no morning sickness. I did experience a big energy drop in the first trimester but have recovered nicely. However, we’ll save the motivation factor for the next section. Home renovation. Yup, we’re at it again! This time we are building a master suite over the kitchen and enclosing the area we currently use as our bedroom as a second proper bedroom for you-know-who. We thought we were giving ourselves plenty of breathing room by initiating things over the summer but of course you don’t plan on having to wait for other people to do their part so here we are right now with nothing to show except a very large ditch in the backyard with which to bury the power lines [someday]. We just got an email that hammers are swinging on Monday. 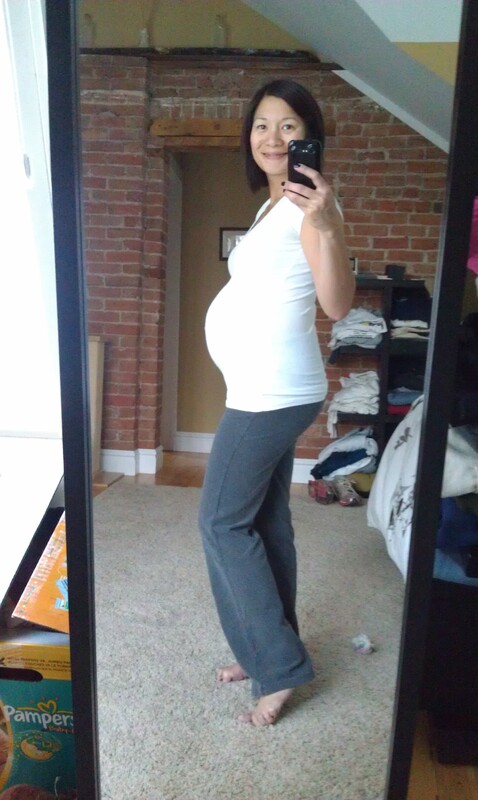 For bonus points, here is where we were at 28 weeks when cooking Maxon. Better nutrition. I just completed the glucose tolerance test and also checked my iron levels and passed both with flying colors. I was surprised by the result of the latter since I had low iron with Maxon and assumed I’d be further in the hole this time. I credit my nutritional inventory on better prenatal vitamins (no more Target knock-offs) and this year’s project to eat organic, local produce and grass-fed beef through our CSA. Alarm on permanent snooze. This is absolutely, positively, no-bones-about-it because of Maxon. If the little man chooses to sleep in, by golly, we are ALL going to sleep in. Instead of the early gym visits before work, I now drop Maxon off at school and then hit the gym about mid-morning. Somehow, even with an unpredictable toddler, we are managing a little more sleep. Yes, we are hoping our bodies are banking it now! Feeling more baby movement. I thought I was a little delusional thinking I could feel this baby at 16 weeks but when I got confirmation that the placenta was in the back (instead of against my belly), there is no mistaking the difference in what I am able to feel. This kid is ON all day, all over the place, and testing for weaknesses. The right side is apparently still where the party’s at. More pelvis discomfort. The belly’s fine. The hips are okay. The lower back can be alleviated if I can shake them out every now and then. But oh me, oh my, some days I just feel like I might split in two if I don’t sit down on a cushy couch and put my feet up immediately. And be spoon-fed grapes mint chocolate chip ice cream. Less working out. Yeah, perhaps I should have been more clear about hitting the gym in the above bullet point. I’m fairly pleased with myself if I get to the gym twice a week. It’s not so much energy level but time, time, time. The time to work out before was a luxury as well as a necessity. Now, I count cleaning, grocery store trips, and laundry as necessities that require that same time. More hatred of maternity clothing. I am just not the body type designers have in mind. Jeans are a joke and sweats are not fashionably acceptable. Many thanks to those who brought the leggings-and-long-sweaters look back! More pampering. Monthly massages and weekly prenatal yoga. Oh yeah. 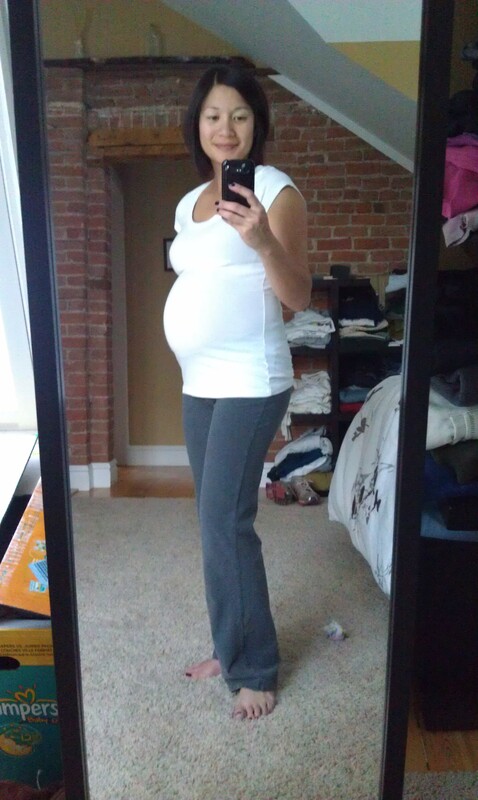 Okay, so the pants are actually the same as the first pregnancy but a little more threadbare. This entry was posted in Photo, Round Two. Bookmark the permalink.